Whew....Good thing we're getting close to Christmas - as I'm reaching way back to the TJNL 12/04 for the Graffiti Technique used on today's card. I decided to update the technique a bit and replaced my card stock with designer series paper. 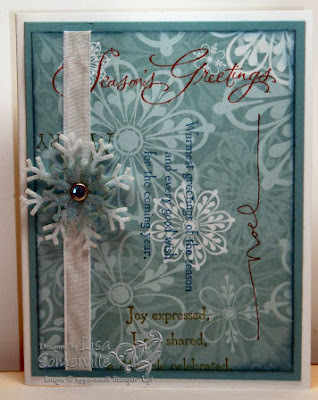 Great way to use up all that extra holiday DSP to make some quick cards! btw, check out this new papercraft challenge site! I love this card, Lisa! OMG Lisa this card is just simply goroeous! I love it! Your work is soooo inspiring to me and although I don't always leave a comment on everything you do, I do check your site every day! Well done and TFS! Just love this! Great idea. Fabulous card. Great colors and I love that snowflake.